MANILA, Philippines – Does your child seem sluggish, weak, or lacking in focus? He may have Energy Gap. According to a recent study by the Food and Nutrition Research Institute (FNRI), four out of five Filipino children ages 6 to 12 years old experience energy deficiency or Energy Gap, a condition brought about by an imbalance between the number of calories a child consumes each day and the number they require to support normal growth, physical activity and body function. MILO, the world’s leading chocolate malt beverage, invites parents to learn more about energy deficiency and how they can help address it. The campaign #BeatEnergyGap encourages moms and dads to give their kids the right amount of energy by serving nutritious meals, making them energized and active throughout the day. “Energy is a basic need of the body as it fuels all body processes from breathing, blood circulation, digestion, and growth. It is also needed for physical activities like walking, running, and even sitting, and mental activities like reading and thinking,” said Nestle Philippines Corporate Nutritionist Executive Ivy Sicat. 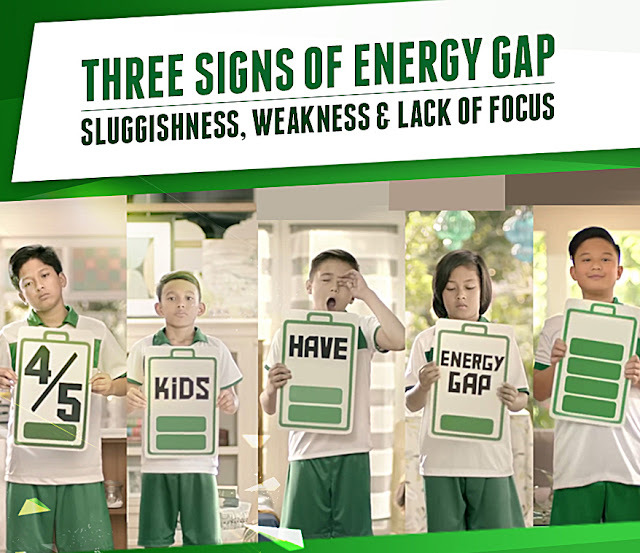 According to Sicat, the three of the most common signs of Energy Gap among children are sluggishness, weakness, and lack of focus. A child may feel sluggish when he lacks motivation in doing physical and mental activities. He may constantly look sleepy or lazy, which can affect the way he absorbs new knowledge. When a child feels weak or lacks in physical strength, he often needs to exert extra effort in doing even simple movements like moving the arms, legs, and other muscles. The feeling of weakness affects a child’s performance not only in sports, but also in doing daily physical activities that will develop and strengthen his body growing up. Lack of focus occurs when there is not enough energy to fuel the brain. When a child lacks focus, it affects how they acquire new lessons in classes and can give a negative impact on his behavior. Other signs a child is experiencing Energy Gap are headaches, stomach aches, and being irritable and restless. Parents shouldn’t be too alarmed because it’s not too late to #BeatEnergyGap. According to Sicat, one of the best ways to prevent it is by giving kids a complete and nutritious meal that contains the right amount of energy, vitamins, and minerals. MILO has ACTIV-GO which contains PROTOMALT®, which provides the energy to help fuel physical and mental activities. It also has Vitamins B2, B3, B6, B12, C, and D, Calcium, and Iron, which help convert food energy to body energy. A complete and balanced meal, along with a mug of MILO, can help moms and dads energize their kids for physical and mental activities. Visit https://www.milo.com.ph for more information about MILO and the Energy Gap.